If your anything like me you will be starting to think about what to buy the kids for Christmas. Each year I find myself taking my child to the toy store to point out the things she likes so I have an idea of what to get her for Christmas. In fact I’ve asked her to write a list of ideas for Santa and hopefully I can buy a few items on the list. I know the big ticket items for Sylvia this year are My Little Pony, Shopkins and Num Noms. Those are the things she really would like. 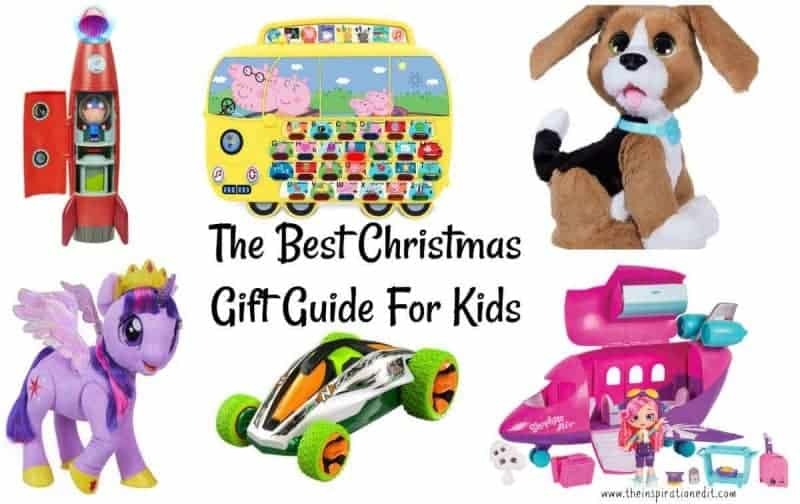 So with this said I am sharing some fabulous ideas for kids for Christmas, both for the stocking and under the tree. The items we are sharing have been reviewed on The Inspiration Edit in 2017, or samples of the products have been sent to us or I genuinely really love the products and can honestly recommend them. or repeat what Peppa says. 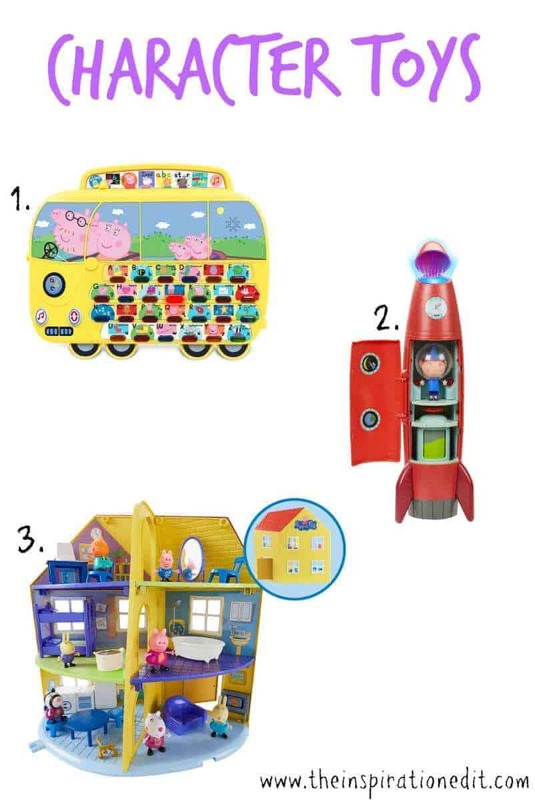 With light-up keys and melodies, the Alphaphonics Campervan is sure to inspire little ones to learn and have fun. Blast off into space with Ben Elf in his space outfit. Open up the doors, to reveal the control room. With; take-off and landing sounds, 4 fun phrases, a torch light (with flashing & steady modes), rotating magic jelly fuel & carry handle! For ages 3 years and over. My daughter has this amazing My Little Pony Canterlot & Seaquestria Castle playset and she plays with it a lot. The fun 2 in 1 playset has the underwater kingdom of Seaquestria and above the land of Canterlot. The set comes with over 33 accessories including Queen Novo and Puffer Fish. Click here to watch our unboxing video. Pinkie Pie the Sea Pony has a mermaid style tail which flaps and enables Pinkie Pie to swim in water. This is a fun toy and my daughter loves to play with her Pinkie Pie Sea Pony in the bath. This is a fun toy and comes with a brush to keep Pinkie Pie’s hair combed. Read our review of Pinkie Pie here. My Magical Princess Twilight Sparkle is the most amazing interactive My Little Pony. 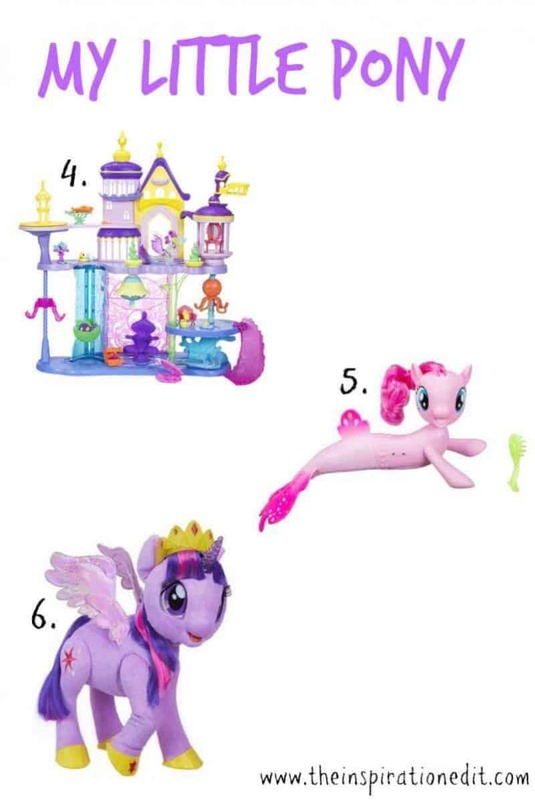 Twilight Sparkle is the perfect companion and has 4 modes. She can sing, tell stories, be a friend and create magic. See her Hoofs move, her eyes flutter and horn light up. This is a fantastic and fun Pony which is sure to make the kids happy this Christmas. My daughter loves her Twilight Sparkle – You can read the review here. Cheeky Monkeys is a fun game where there’s no hanging around as you battle to collect the most bananas – but watch out for other players trying to steal them! Designed for children aged 4-8, this game of chance encourages children to think strategically and make decisions. 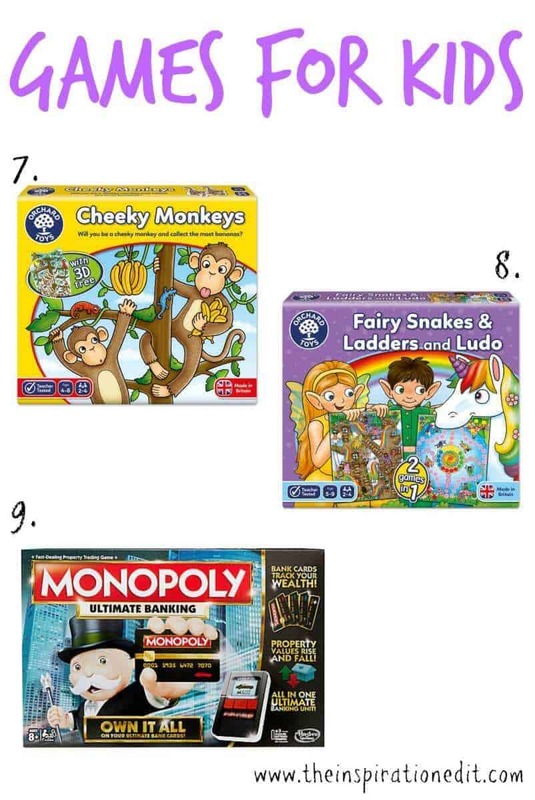 Read our review of Cheeky Monkeys here. Introducing a modern banking version of the Monopoly game, The Ultimate Banking Edition of Monopoly features an all-in-one Ultimate Banking unit with touch technology that makes the game fast and fun. Now players can instantly buy properties, set rent, and tap their way to fortune. Each player gets a bankcard and the Ultimate Banking unit keeps track of everyone’s fortunes. My daughter is getting this game for Christmas and she has no idea. The Go-Go Cafe Playset is the perfect playground for Num Noms. Stack your favourite Num on top of your motorised Nom and let them loose in the playground! Watch them “splash” in the teapot shower, have a ride on the teeter totter saucer, or take a spin in the donut wheel! My daughter is a super fan of Shopkins and collects the Shoppies Doll range. Today we are sharing Apple Blossom the very first Shoppie Doll. If your looking to buy a Shoppie doll this Christmas Apple Blossom is a great doll to start with. See our Shoppies Dolls review here. Introducing the new fabulously fashionable travel Shoppies Dolls! 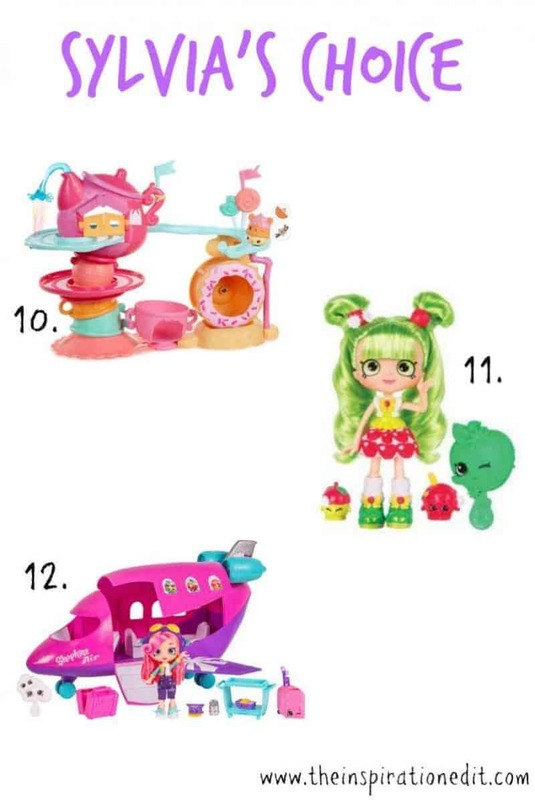 The Shoppies Skyanna’s Jet playset comes with an exclusive Skyanna pilot doll, 3 exclusive Shopkins characters, a Jet plane playset, a suitcase, an exclusive luggage bag, a cart, a suitcase, a passport, a hairbrush and a VIP card. This was on my daughter’s Christmas wish list and we were fortunate to be able to review it this week. The Star Wars Forces of Destiny Extendable Staff is a fantastic toy for any budding Star Wars fan. 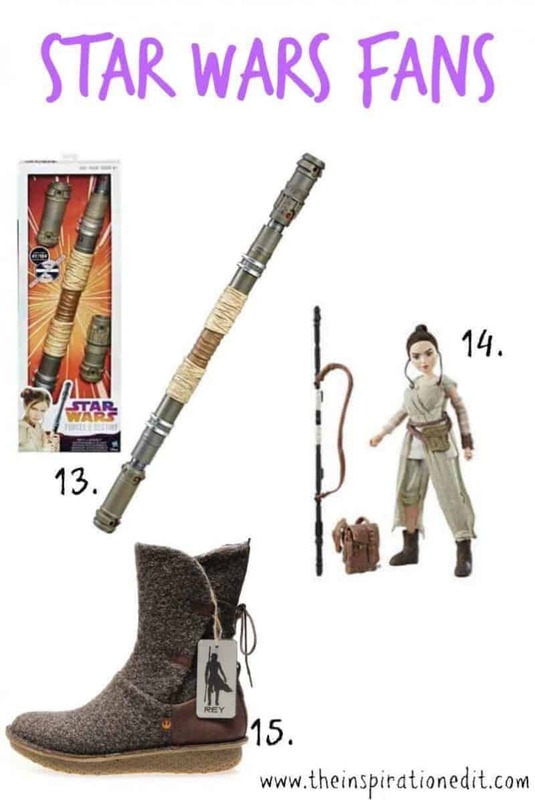 My daughter is a fan of Rey and this staff can spin and snap out to over 3.5 feet lonG. It’s a really great size for kids to use while acting out Star Wars scenes or reenacting scenes on the planet Jakku. Check out our full review of the Star Wars Extendable Staff here. This is a great action figure for any boy or girl to enjoy. Rey is brave, true to her friends, and stands up for what she believes in! This highly-poseable figure features beautiful rooted hair, and a draped top, shirt, belt with scavenger bag, shoes, arm wraps, bracelet, and backpack she can be dressed in to get her ready for adventure. These Star Wars themed high boots are the perfect gift for a fan of Star Wars Heroine Rey. PO-ZU have a fabulous collection of Star Wars themed boots which are sustainable and made from materials such as organic cotton, pineapple -leaf fibre and cork. These boots are a great addition for the Rey costume and great to wear in the Autumn and Winter seasons. The Grit Extremist Iced Blue 2018 Stunt Scooter is a great beginner scooter for a rider wanting to get into Scooting and trying it out for the first time. Sylvia has been asking for a scooter for over a year and she is now going to receive this wonderful scooter for Christmas. The Nikko Psycho Gyro is a fantastic Radio Control Car. Its Gyro Stunt technology lets racers spin their cars around on two wheels. Even wilder, kids can do spins and stunts on just one wheel! You control the stunts. This racer has speed and stamina and is ready to rip up the road! The high grip tyres allow for high performance traction both indoors and out. The Nikko Psycho Gyro is available from Argos, Debenhams, Menkind, Hamley’s and SMYTHS. Perfect for developing co-ordination skills the classic take-a-part play sets include a motorised socket driver drill. Little ones can experience the fun of building and removing the parts themselves. There are 2 fun characters to collect including; Haulin’ Harry™ and Movin’ Morgan™. This toy is for Ages 3+ and is available from Morrisons, Toymaster and Debenhams. 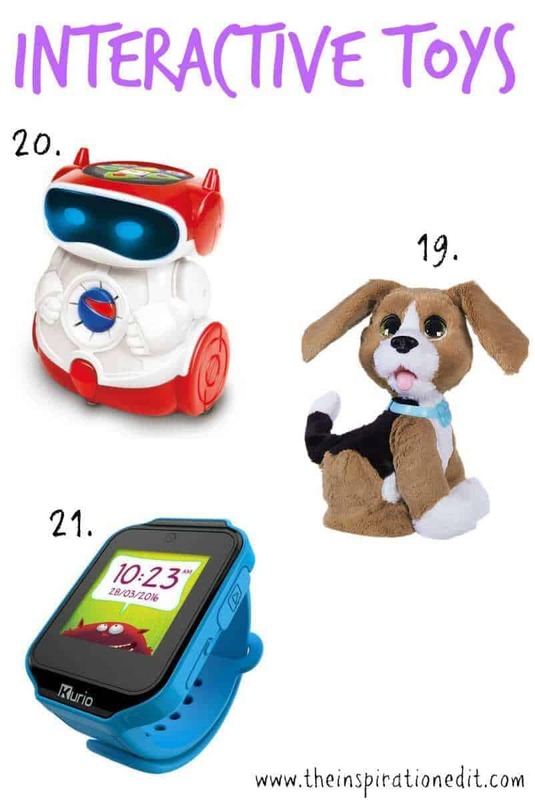 Doc Educational Smart Robot enables children to learn as they play while programming commands. Doc is the first ever game that brings children closer to Educational robotics in a fun and creative way. The Doc Educational Smart Robot can be programmed to roam at will or follow pre-programmed routes. Chatty Charlie the Barkin’ Beagle is ready to play… and his favourite game is responding to YOU! The cuddly pup’s light-up collar translates his barks into phrases so you can understand him. And with 80+ barks to phrases, he has a lot to say! Read our review of Chatty Charlie here. The Kurio Watch is The Ultimate Smart Watch built for kids. Pre-loaded with 20 apps for motion gaming, education and social communication with a multi-function screen. The Smart watch can take pictures with filters, record videos, text, play music, play videos, activity track, translate key language phrases and can also operate as a hands free kit for an Android Smartphone/Tablet. This is a fabulous gift for a child and Sylvia is getting one of these for Christmas. This Hape Pepe Magnetic Stacker is a great stacking toy for little ones. Made with colourful wooden rings this toy can help to develop hand-eye co-ordination as well as colour recognition skills. The Hape Sights and Sounds Railway Set is a sure favourite for Christmas. This train set is rainbow coloured and includes fun musical sections of track. This product is great for helping children with sound recognition, hand eye coordination skills and sparking the imagination. This Hape Peg Puzzle Clock is a fantastic toy for developing motor skills but also learning basic numbers, the minutes, and the hours. This puzzle clock can has plenty of colours and shapes and is a really nice educational toy for little ones. George Luck Amazing Animal Alphabet Puzzle. This fantastic animal puzzle makes learning the alphabet fun. Kids can learn the names of animals, talk about colours and develop hand eye co-ordination skills as they play with this fun and entertaining toy. 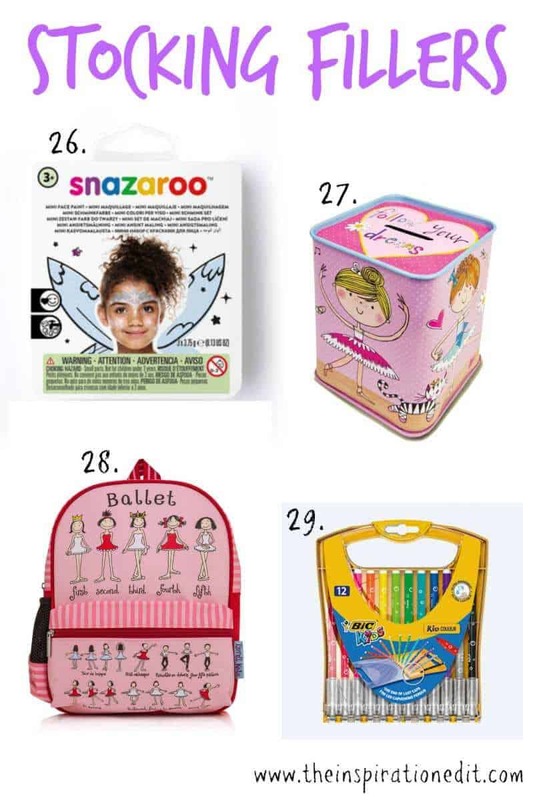 The easy at-home range by Snazaroo features ten “how to” face paint designs. This could be a fun and fab gift for the little ones and is the perfect stocking filler to help recreate your child’s favourite characters. This adorable money box is perfect for storing pocket money or pennies for dance class. Featuring an adorable print of ballerinas and a friendly cat against a spotted pink background, and the inspirational Follow Your Dreams text on the top of the box, this money box makes the perfect gift for young dancers. This adorable children’s backpack has handy adjustable straps for a personalised, comfortable fit. With a side pocket for storing that essential water bottle, and a front pocket for keeping clips, pens, and all your other little bits and bobs, this backpack is the perfect companion for school or dance class. The cute ballet position print is wonderful for little dance lovers! Your child never needs to fret about losing a pen cap again with this innovative stand-up, rainbow-effect case that keeps the pens and lids all in one. Enabling these pens to be displayed in harmony, this problem-solving pen case is full of a dozen medium-tip, felt-tip pens to take any piece of artwork up a notch. Did you spot anything you’d like? Do let me know what your favourite item is. Thanks for some great ideas! A lot of my friends have children of these ages now so this will help me a lot! Awesome. I am glad this will help. All these toys look great! I love playing Monopoly. Not only for kids then! When I was younger, I could only swear by Playmobil! such a great toy! What some absolutely awesome looking toys for Christmas, I have to admit I love Monopoly been thinking about getting a new addition for Christmas. Monopoly is a fun game to play and I love the fact this new one has fun technology. These are some great picks! If my daughter were smaller, she’d love them. She used to play with My Little Pony toys ALL the time. Yes the My little pony toys are a big hit in our home too! yes i know what Sylvia is into at the moment …It took a while to work out but Shoppie Dolls are number one on her christmas list. That ballet backpack is too cute! I think my niece would love it. She’d also really enjoy the My Little Pony items. Thanks for sharing all of these. It is super cute and I think it’s perfect for a little dancer. I am off to use a voucher i have to buy some things for Sylvia’s santa sack! Yes Sylvia does love Twilight Sparkle. Twilight is a fantastic toy. This is a great gift guide. I am sure Start Wars toys will be a popular gift this year. I will have to share this with my friends with kids. Oh STar Wars is always popular. For sure! Great toys for all ages. I do have to start my list and get into my shopping mode. Yes me too. I need to look for Shoppie dolls for Sylvia. What a super collection of toys! My kids would love stuff like this! Thanks Elizabeth. 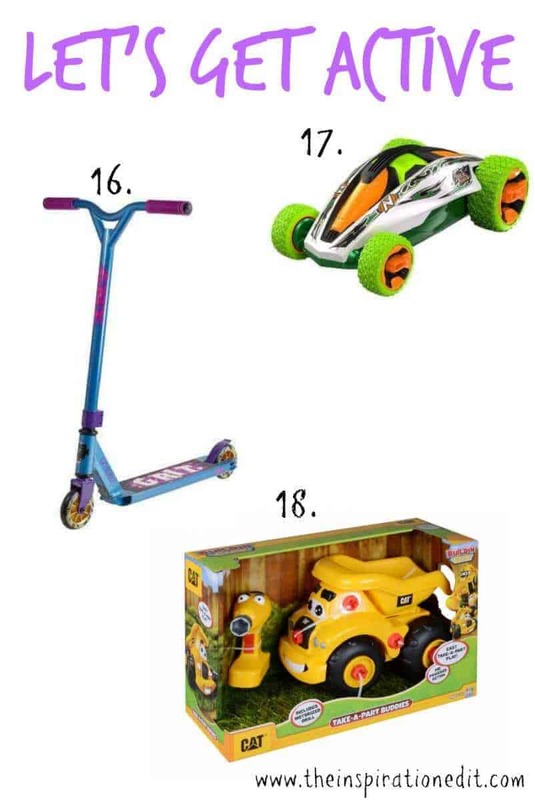 This is a great list of toy ideas. Very good idea,it was very helpful for me for selecting some toys.. I have two little boys and they would love all of these! This is a great collection of toy ideas! 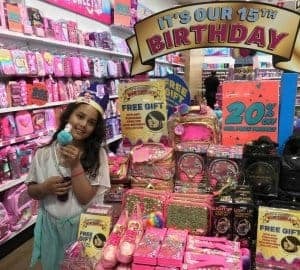 I bet, there are so many toys to choose from these days! My little pony looks so much different than when I was growing up. I am happy they are back for this generation of girls to enjoy. Yes, they have changed a little over the years but I think they are fab now. My Little Pony is really cute! I’m sure my niece will love it! 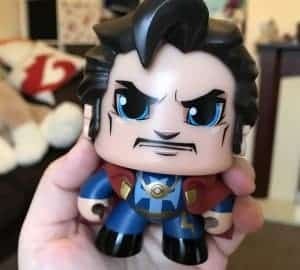 Yes it’s a great brand and toy! I haven’t started my Christmas shopping so this is helpful for me. 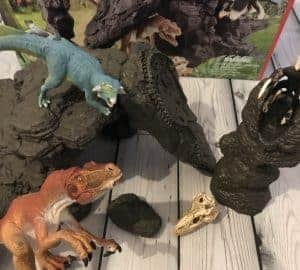 I agree that these are the best toys and kids will surely love any from this! Yes there are some great ideas on this list. 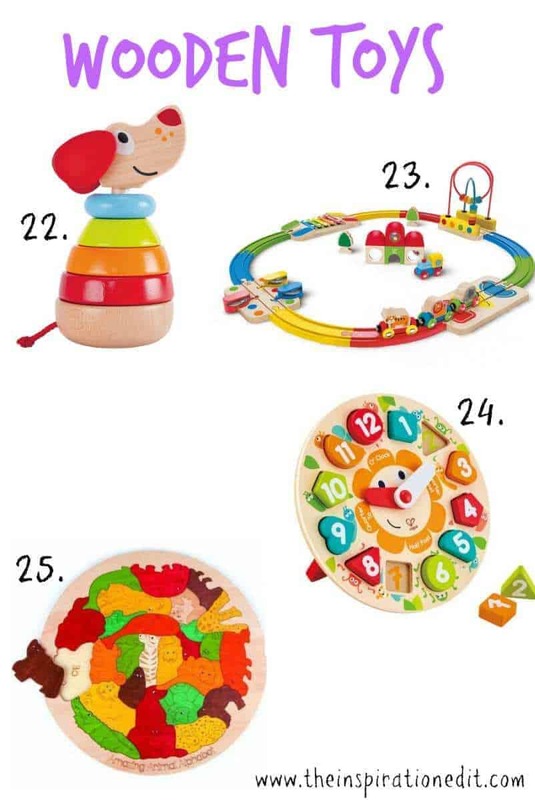 The wooden toys are fab and educational! Thank you so much for creating this gift guide! It makes finding the perfect toy so much easier. I don’t have kids so I need all the help I can get! I have no clue what’s popular and what is not! It sure does. i’ve done all the research and it’s now a great resource of ideas. These are great gift ideas! We love Monopoly game board. It’s a fun family board game. These are great shopping recommendations for Christmas. My friends’ kids would love these toys. Thanks for sharing. These are such amazing gifts. Will definitely keep this list handy while shopping. Awesome. Let me know if you get any of them! I like the My little pony. Yes the Star Wars ones are good. So many great gift ideas! Such a nice guide in thinking of what to give this Holiday season. 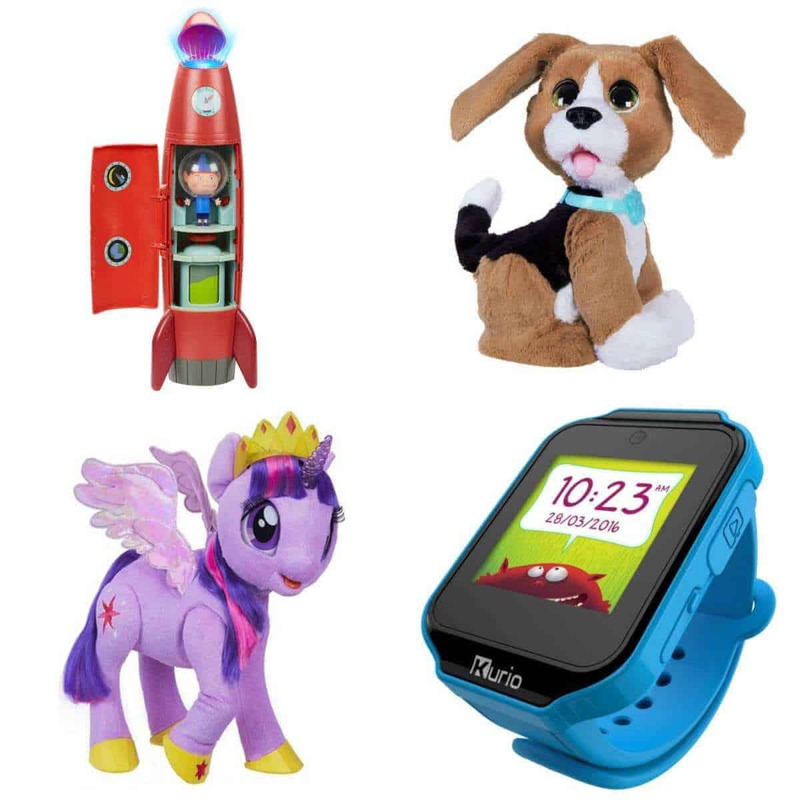 I personally would want the Little Pony collection and the Kuro Smart Watch. the Kurio watch is a big thing this year!